In the given article some practical and idealized visions on a problem of dissolution of carboneum in a melt ferri lactas are submitted. The outcomes of the acoustic and chemical analyses on detection of a structural non-uniformity of studied casting - crankshaft of weight 4,5 tons are adduced. The thermodynamic model of process of carbonizing a synthetic melt is offered. Methods and results of calculating metal consumption in gating systems with different numbers of runners and their different locations relative to the sprue are set forth. Peculiarities of applying the Bernoulli equation to the flow sections with different flow rates are shown. Experimental data on the determination of flow rates in parallel pipelines with different hydraulic resistances when casting an Al alloy under the pressure of a magnetohydrodynamic pump are given. 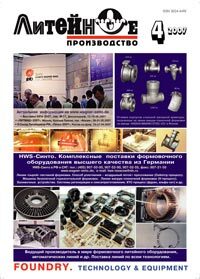 Samsonov Y. N. On the Occasion of the 40th Anniversary of the Science-and-Technology Laboratory at OAO "West Siberian Integrated Iron-and-Steel Works"
Effect of molding sand binders on the physical-and-mechanical and process properties of molding sands has been investigated. An optimal molding sand composition has been proposed and substantiated. A 25 to 30% higher strength in the bentonite condensation zone, including those with a low montmorillonite contents (Zyryansky, Berezovsky, Voronezhsky and other bentonite grades) can be achieved by using the double activation technology ("Isact-Process"). The proposed activation technology can be most easily introduced at foundries where a clay (bentonite) suspension is used for molding sand preparation. Effect of various treatments of disk-shaped castings with granular structure is investigated. Compacting castings by the method of hot isostatic pressing results in a minimum microporosity as compared to castings with columnar or polycrystalline structure. The isothermal pressing allows increasing the density of the granular structure, enhancing the alloy's ductility, increasing long-term strength with high values of alloy's residual ductility, which results in a higher reliability and stability of cast part properties. Thixoforming is a novel process that competes with more traditional manufacturing processes by shaping materials whilst in the semi-solid state. Although the technology involved is complex compared with casting and forging, it is no more complex than die-casting or squeeze casting. Thixoformed complex near net shaped products in aluminium alloys are already finding their way in automotive applications, and developments with load bearing applications are proceeding apace. The ability to produce near net shape components considerably reduces the need for machining and results in less scrap. Automation of the process results in repeatability and consistency of high quality products with the direct benefit of fewer rejections and overall higher product yield. Thixoforming has seen commercialization within the automotive industry around existing alloy compositions based on the aluminium-silicon casting 356 and 357 alloys. Current work reflects on traditional casting A356 and high strength A201 casting aluminium alloys, as well as other wrought alloys, discussed from an aerospace application perspective. In this article gave the analysis to changing physical and mechanical properties of bronze BrO5Zn5SL5 to depend on model density, wall corpulence of model, temperature of melting metal on the loose model casting.